Vietnam's ascending dragon; Hanoi is chaotic and charming in equal parts. 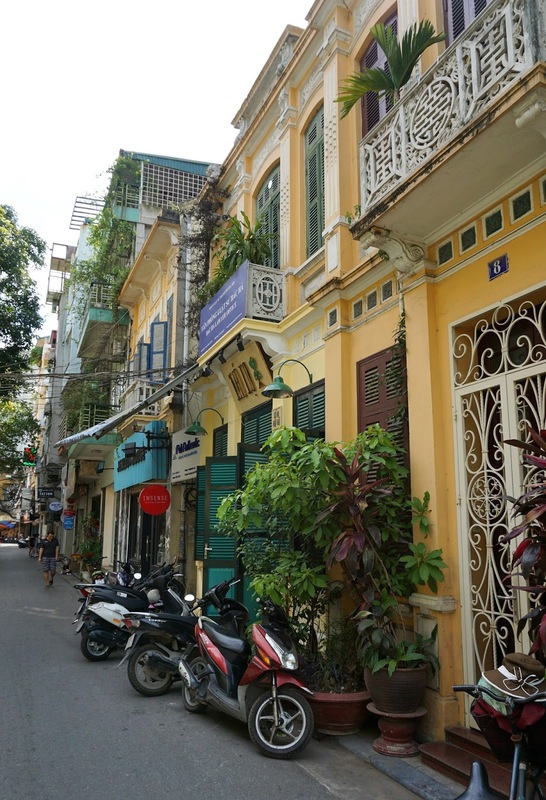 Our week in the Vietnamese capital was a trip highlight - the French colonial architecture, incredible street food and rich history ticking all of those travel boxes for me. Much like my other SE Asian city favourites Penang and Chiang Mai, I loved Hanoi's perfectly imperfect streets. The peeling brightly painted walls and old wooden shutters make the perfect backdrop to a mix of old and new; conical hats and whole families riding on mopeds - it's complete madness. But lovable madness! One of the joys of Vietnam is that accommodation is still relatively cheap. Hotels in Thailand and Bali in particular have increased in price over the years; having visited both countries previously we noticed how much prices had shot up this time round (2016). The same doesn't seem to have happened in Vietnam... yet! We stayed in Noble and Swan Boutique Hotel - perfectly located within the old quarter, it took less than 10 minutes to walk to Hoàn Kiếm lake and about the same to Beer Corner. We paid £18 a night for a double room with en suite bathroom; the bed was insanely comfortable with super soft bedding, the bathroom was beautifully decorated with a powerful waterfall shower and we had a small balcony where we could enjoy watching the sun set over Hanoi's rooftops. Our room was impeccably clean and the room rate included a delicious buffet breakfast. The staff went above and beyond, even scanning my EU referendum (sob) proxy vote registration form and emailing back home for me! Seven days in Hanoi was a good length of time to get a real feel for the city, but we could easily have spent longer. We actually split our time in Hanoi with a trip to Sapa and a motorbike trip round Northern Vietnam (more on that later) before coming back to the city for a few days; despite Hanoi being a huge bustling city, we felt comforted coming back to the madness. Once you find your feet, it doesn't feel so big and is the perfect mix of old and new, Western and local. Once sarcastically dubbed the 'Hanoi Hilton' by US Prisoners of War for it's notoriously bad conditions, it is now a museum documenting the story of the prison over the years. Originally used by the French to imprison Vietnamese revolutionaries and then later by the Vietnamese to hold US POWs, it has a sad and brutal history. It famously held John McCain for five years, and the Vietnamese claim to have treated him and other POWs "better than their own". Aside from the almost laughably-biased tales and exhibits, it is an interesting insight in to Hanoi's history. The Vietnam War (or as they call it the American War) is still, unsurprisingly, etched in the collective memory here. Walk round the lake of the restored sword, and forget you are in the humming metropolis. Cross the red Huc bridge towards Jade Island where you can visit the impressive Ngoc Son Temple (for a fee), or walk round the perimeter of the lake and observe Hanonian society. From keep fit classes to elderly gentlemen reading the paper, and street vendors to ladies gossiping and chatting... it is brimming with life! Grab a cà phê sữa đá (iced Vietnamese coffee, pronounced cafe sue-a da), find a vacant bench and soak it all up. Once the longest bridge in Asia, Long Biên connects two districts in Hanoi over the Red River. Used by trains, mopeds, bicycles and pedestrians it is full of life; visit in the morning to see local markets and people making their commute across Hanoi. It stretches 1.5 miles in length and would recommend walking at least part of the length for views over the Red River and beyond. And visit whilst you can; there is talk of rerouting the train line and transforming the bridge in to a museum. I really hope not - it's such a central part of Hanoi. Something we were recommended by a friend; a free walking tour to help you find your feet and get a bit of local info. We booked through Vietnam Group Tour and were met at our hotel by two students who showed us around the city. They were really sweet; both at college and in their late teens they told us a little about Vietnamese history, took us to the main city sights and explained how the guild streets in the Old Quarter worked. Yes, there were a few awkward moments as a result of the language barrier, but on the whole their English was great and it was a great way to see the city! An interesting way of seeing Hanoi from a totally different perspective; through the lens of your camera! My morning with Vietnam in Focus was one of my best travelling experiences of the six months, I was given information and tips on how to use my camera in manual from a professional, and was shown how to see Hanoi through the eye of a travel photographer. I was able to see Hanoi for what makes it special; it's quirks and intricacies. I've blogged about it in more detail here. Leaving the best 'til last - the food. Hanoi is known for street food; from the best phở, to bún chả, cà phê trứng and bánh mì - it is every food lover's paradise. Not only are new tastes and delicacies bursting from every alley way, the food is so unbelievably cheap. The language barrier combined with small, family run stalls can be intimidating - many locals don't speak English and whilst pointing at what you want with a cheeky smile is usually effective, you often are not quite sure what you're eating! Step in, the street food tour. Mark and Tu live in Hanoi and know all the best spots to get the best street eats - hit them up, you wont regret it! Full post here. As ever, we did a lot of eating during our time in Hanoi! These are the restaurants we ate at, and for ease I've divided into Vietnamese and Western options. Bia Hơi - not a specific place as such, but be sure to try some locally brewed beer whilst you're in Hanoi! At around 15p (June 2016) a glass, it'd be rude not to. Look out for signs, and get in there early - most places only have a limited supply. If in doubt, head to Beer Corner but the fresher, tastier brews can be found slightly outside of the tourist spots. Rich recommends Bia Hơi Ngọc Linh which can be found at 71 Bát Đàn. Interesting post, thank you for visiting my country.